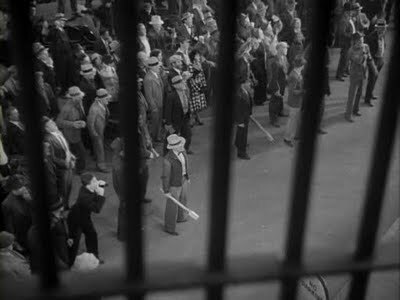 Tuesday’s still from The Third Man introduced us to a confused, dead-eyed, grief-stricken Holly Martins—a stranger in a strange land, with the world against him. 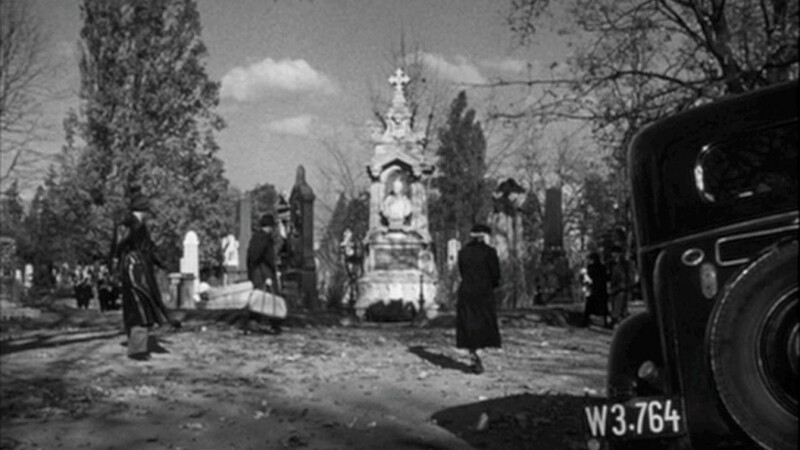 At the funeral for his longtime friend Harry Lime, Holly finds himself surrounded by a small group of strangers, most of whom cast suspicious glances at him whilst “paying their respects.” The preceding scene, in other words, introduced us to a number of characters that we’ll come to know throughout The Third Man—cyphers we do not yet know, some of whom are friendly, some of whom are…not. The sheer number of figures in today’s still, then—all of whom are captured in long shot, distant, blurry shapes whose identities are indecipherable—seems appropriate. Previous to this shot, director Carol Reed and editor Oswald Hafenrichter have cut between a number of medium shots to visually introduce us to the ensemble. At Harry’s funeral, we see (but don’t yet “meet”): Anna Schmidt (Alida Valli), Harry’s former lover; Major Calloway (Trevor Howard), a benevolent if cynical British military officer; “Baron” Kurtz (Ernst Deutsch), a shady associate of Harry’s, who we can guess is villainous practically as soon as we see him; and a colleague of Harry’s/Kurtz’s, Dr. Winkel (Erich Ponto), whose silent, interrogative stare does not bode well for Holly. The viewer is in the same position as Holly in this scene: we see all of these characters but don’t yet know who they are. Who among them are to be trusted? And more importantly, who cannot be? 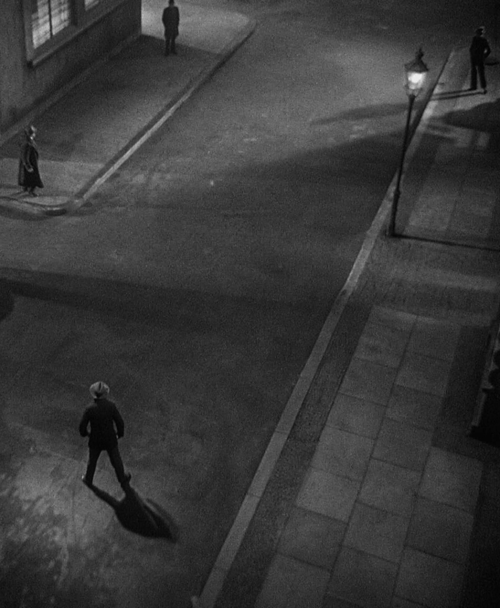 Aside from its shot scale, today’s Third Man still is remarkable for its off-kilter composition. We have three dominant vertical figures splitting the screen into thirds: that towering tree on the left, the stately headstone in the middle, and the tilting black car on the right. While these three figures remain unmoving, turning the still into a loose grid of sorts, the human figures move between and among them, striking diagonal patterns of movement that clash uneasily with those three vertical constants. 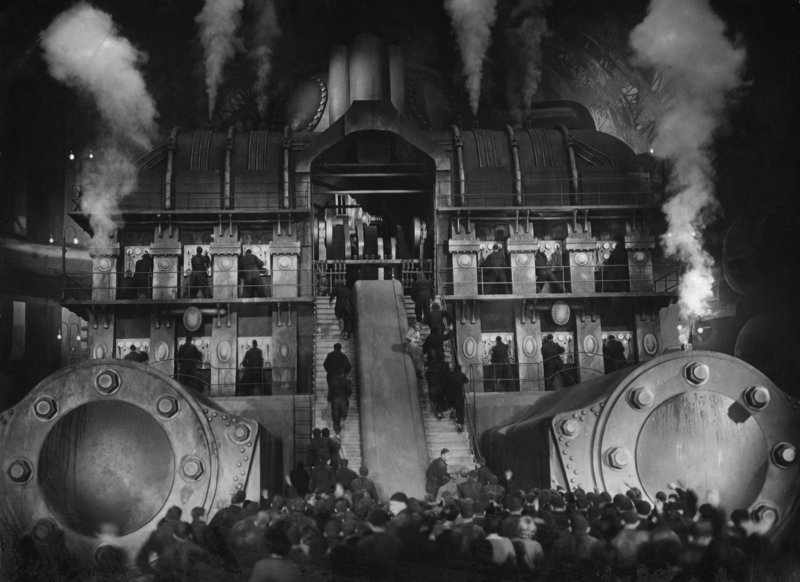 (Obviously we can’t glean this movement from the still above, but their converging paths, set against such towering and rigid visual markers, are surprisingly unsettling when this scene is set into motion.) I am especially intrigued by that license plate: I keep poring over those digits, “W3*764,” as though they had some kind of bearing on The Third Man itself. The information is predominant in the image, but, it seems, completely irrelevant. It’s Roland Barthes’ “obtuse meaning” all over again: a sign without signification, “a luxury, an expenditure with no exchange” (“The Third Meaning,” 62-3). That license plate, in other words, seems to present a cinematic delight that spectators indulge in constantly but rarely recognize: that of watching a figure or image onscreen that is completely irrelevant to narrative, character, theme, to anything that signifies, but is nonetheless enjoyable to perceive and peruse—it still visually exists. I know that license plate means nothing, and maybe that’s why I’m so entranced by it.